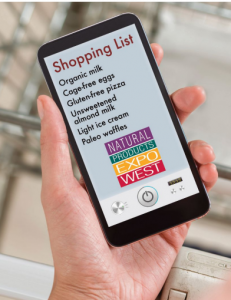 What’s on the Natural Shopper’s List? Odds are you’ll find it — and a lot more — at Expo West. Here’s a look at what’s hot in Anaheim. More than 80,000 people are expected to converge on the Anaheim Convention Center March 8 to 11 for the 38th annual Natural Products Expo West. Billed as one of the largest gatherings of natural, organic and specialty product suppliers in the world, the 2018 event will feature more than 3,100 exhibitors, including 500+ first-timers, from at least 120 different countries. “For the first time,” reports Maryellen Molyneaux, president/managing partner of the Natural Marketing Institute (NMI), Harleysville, Pa., “health and nutrition has surpassed good value for the money in consumer rankings of food and beverage attributes most important to them (it’s now second only to taste).” In addition, she reports, the number of consumers categorized as “Well-Beings,” i.e. those most focused on healthy eating, grew from 16% of the population in 2009 to 26% in 2017, representing approximately 64 million adults. At the same time, the number of “Eat, Drink and Be Merrys,” i.e. those least interested in healthy eating, fell from 26% to 17%. What exactly does that future hold for frozen food? Because so many natural consumers in particular used to avoid frozen food, believing it overly processed and unhealthy, manufacturers of better-for-you items in the space often overcompensate by attaining more certifications and verifications than might be necessary, says Jenna Blumenthal, senior food editor at New Hope Network. So attendees should expect to see products that call out everything from “Non GMO Project verified” to “Whole 30 approved,” the latter of which refers to a strict paleo-type diet that’s gaining some momentum. Frozen foods play an important role in those types of plans because they would be very difficult to follow if consumers had to make all their own meals from scratch, adds Mast, who expects to see a lot more frozen products with diet-specific certifications. She also anticipates more items made with humanely raised proteins, citing organic, grass-fed beef patties from frozen NEXTY Award finalist Tribali as an example. “It’s a very convenient product but it has all of the attributes and certifications a conscious consumer would look for.” Right now, adds Mast, those shoppers have very limited options. Same thing in the sustainable seafood category where convenient items are few and far between, says Blumenthal, pointing to another NEXTY finalist: frozen fish bowls from Love the Wild. “We’ve been big fans of the brand for a long time,” she notes, also calling out its intriguing flavors and traceability. “Healthy convenience in general is a strong and growing trend,” confirms Molyneaux. “There’s a huge population out there whose attitudes around eating have already changed. But they need help. So it’s important for retailers to keep up by giving them frozen products that make it easy [to eat healthy].” An added bonus: a robust frozen department can become a real destination because it offers products Amazon hasn’t yet figured out how to deliver cost-effectively. One area where retailers need to step up their frozen game is plant-based proteins. Dollar sales of frozen products that call out protein or high protein rose 13% during the past year, reports Molyneaux. But those that carry plant-based protein claims jumped 21%, albeit off a low base. “Based on what’s happened in other categories, we know there are some significant opportunities there,” she says, citing plant-based dairy as an example. One product that combines both: Daiya’s new dairyfree Meatless Meat Lovers Pizza. Again, says Blumenthal, it’s all about convenience. “To be able to buy a frozen plant-based vegan pizza already assembled rather than having to buy all the ingredients and make it yourself from scratch is a real time-saver,” she explains. Daiya isn’t the only frozen manufacturer stretching the boundaries of plant-based, says Mast, citing GoodPop’s new vegan cookies ‘n cream freezer pops as another example. Made with coconut milk, it boasts a creamier base than some of its predecessors, delivering a more decadent non-dairy dessert experience in a more sophisticated flavor. Plus, it’s certified fair trade, “So it’s using its platform for a greater purpose,” says Mast, who expects to see more companies touting their good deeds, sharing compelling backstories and offering greater transparency and traceability. On the refrigerated side of the show, attendees should expect to see a lot more single-serve snacks, fresh meals and other packaged convenience items as natural and organic expands into the graband-go area of the perimeter. Refrigerated snack and energy bars will be especially prevalent. Visitors will also be greeted by the usual abundance of functional beverages — many organic — that incorporate pioneering ingredients. Grass-fed dairy and meat will also be well-represented, though Mast says attendees should be wary of products without certification since some manufacturers apply the term rather loosely, creating the possibility of a backlash. Products created using regenerative agricultural practices are also expected to be popular. Cassidy also expects to see more big CPG companies at Expo West. Whether through creation of their own brands or acquisition of existing ones, “They all want to be part of this opportunity,” he says. The writing is on the wall: better-for-you really is the future of food.